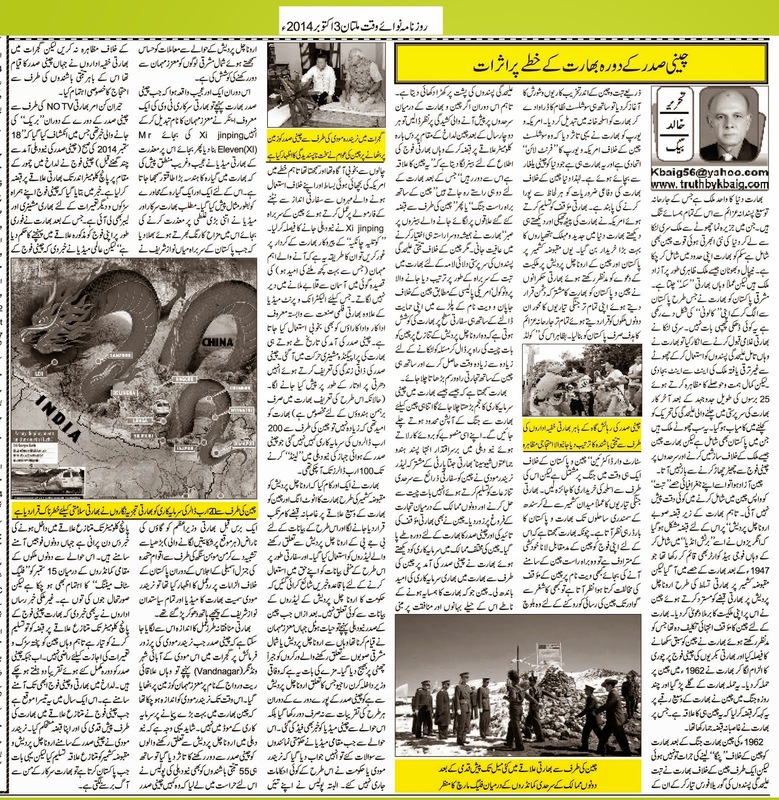 Truth by Kbaig: Affects of Chinese President’s Visit to India on the Region!!! Affects of Chinese President’s Visit to India on the Region!!! India is the only country of the world which imperialist plans against all her neighboring countries. From small country like Sri Lanka to rising Super Power like China all are included in the list of sufferers from Indian conspiracies. Sikkim had been already engulfed by India while Nepal and Bhutan in spite of apparently being independent are actually controlled by India. The separation and conversion of Eastern Pakistan into COLONY of India is no more a secret. Sri Lanka denied to accept supremacy of India, India invented Tamil Tigers (terrorists) and devastated a small underdeveloped country. But Lankans with their courage won the 25 years long war against Indian trained gorilla terrorists known as Tamil Tigers. All these countries are small countries including Pakistan. But India also did not miss a chance of skirmish with Chinese army or hatch conspiracies against China. When China got independence, she did not face any problem in remerging her integral part Tibet but while reclaiming Arunachal China is facing problems because English captured and included it into British India and India now claims Arunachal being an integral part of India just like Kashmir. 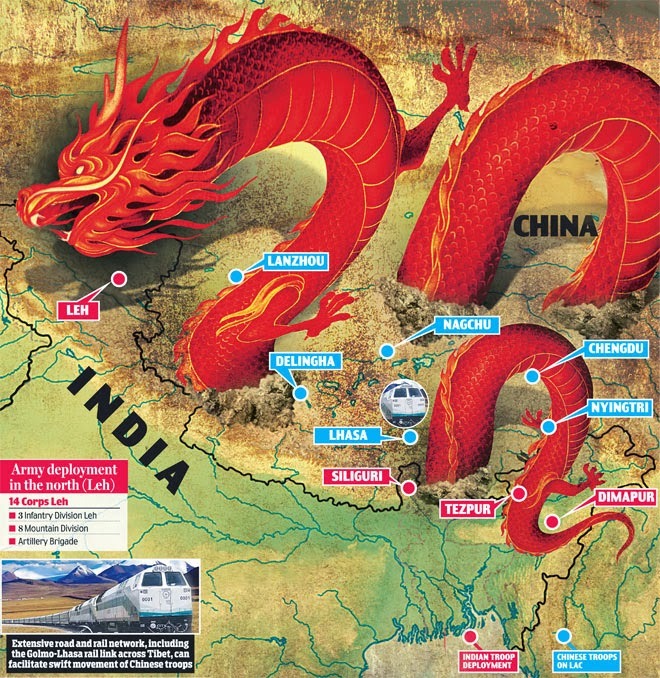 China rejected Indian capture over Kashmir and Arunachal Pradesh and claimed its ownership. India could not bear such a strict stance from China and decided to teach a lesson to China. India accused Chinese army for stealing Indian goats and attacked China in 1962. Attack over China proved to be a wrong a decision for India and within few days of the war, China captured many areas controlled by India; claiming that these areas were part of China which India had captured illegally. After attack over 1962 war, India did not dare to attack China again but she on the one hand established a gorilla force of Tibetan separatist terrorists and started terrorism within China. On the other hand India made Europe and USA believe that she is ally of West against Socialism and only country which is safeguarding world from the Chinese Socialism so this is the duty of the anti-China powers to provide latest weapons to India. USA backed Indian stance and within no time India became one of the biggest customers of latest lethal weapons. Indian army claims Pakistan and China as a collective enemy due to Kashmir and Arunachal Pradesh disputes but actual target of Indian war mania and state terrorism is Pakistan only. Apparently Indian COLD START WAR DOCTRINE consists of war against China and Pakistan at the same time but if we look at the Indian war plans, deals of weapons etc. the practical war field of India is from Kashmir to Coastal line of Sindh. As India knows that direct aggression against China is equivalent to suicide for her armed forces that is why sometimes India is seen rejecting Chinese stance over Vietnam or standing behind the Indian trained (so called) Baloch terrorists in order to stop Chinese access to Gwadar. 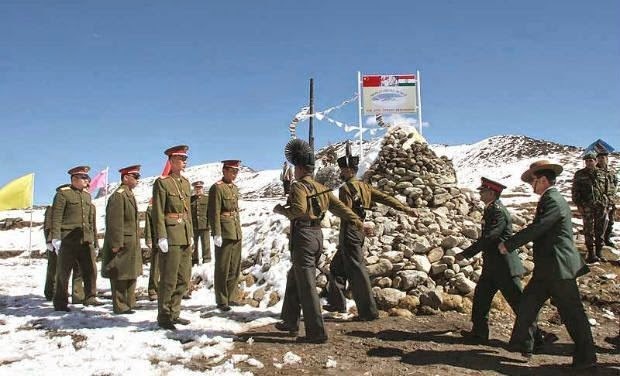 If we look at the situation on China-India border we see that every 2 to 4 years Chinese army advances 10-12 kilometers in the area controlled by Indian army and fixes banners that this is Chinese territory so stay away. After advance of Chinese army, India had two options left either to attack advancing Chinese troops or keep silent; India prefers the second option. But on one hand India provides protocol to Dalai Lama, favors Japan and Vietnam as per the policy of USA; on the other India is trying to buy time by delaying the Arunachal Pradesh dispute in the name of negotiations and procuring Chinese investment in India. India believes that with increased Chinese investment in India, China will have limited options left for direct attack over India. Following this policy, mutual leader of Hindu Extremist Parties i.e. Shiv Sena and BJP, Narendra Modi accepted the existence of territorial disputes with China and invited Chinese President to resolve these disputes through negotiations and increase trade between both countries. 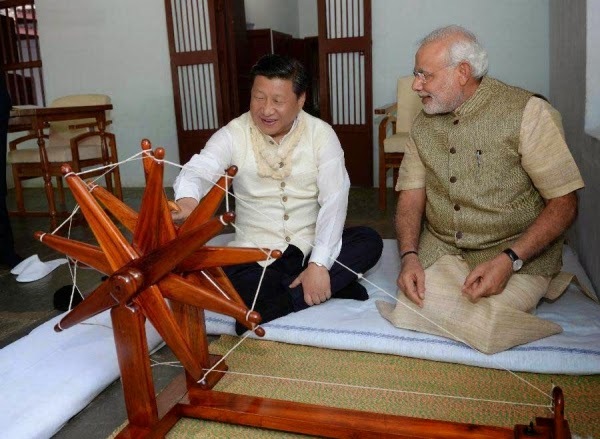 China also accepted Indian invitation and Chinese President visited India. Keeping in view the Chinese investment in different countries; Indians hoped a big investment in India as well. China that is well aware of Indian conspiracies and American traps laid down in the region with the help of India, so China decided to tackle pawns used by USA against her through diplomacy and Chinese President decided to visit China. If we look at the policy of followers of Kotalaya Chanakiya; we see that Hindus do not leave any stone unturned in the flattery coming guest (even if they consider him as enemy) if that guest has something big to offer. For this purpose Indian propaganda machinery, actor and actresses and electronic and print media were fully utilized. Different parts of the Chinese President’s life were covered by Indian media and he was represented as Avatar for the world. Indian was hopeful that China would sign deals of at least 200 billion dollars which were brought down to 100 billion dollars till landing of the Chinese President’s plane. Another step was that BJP leaders belonging to Arunachal Pradesh claimed Arunachal Pradesh as integral part of India and blamed China for capturing Indian areas aggressively. In order to exploit such statements diplomatically, special statements were issued that Indian govt. has no link with such claims of Arunachal Pradesh’s leaders. Afterwards when Chinese President arrived in India, the employees of hotel belonging to Tibet or Arunachal Pradesh were sent on forced leave, where he was scheduled to stay. Moreover, Federal Interior Minister, Kiran Rajiv belonging to Arunachal Pradesh was also kept away from Chinese President and Chinese media was given special news report of it. When Indian media inquired into this issue, Indian govt. claimed that Narendra Modi or govt. had not issued any orders in this regard, however, Police on its own kept people of Arunachal Pradesh and North-East areas away from Chinese Guests. When Chinese President arrived in India a famous Anchorperson of State TV of India announced name of Chinese President as Mr ELEVEN in spite of Xi Jinping. In spite of apologizing over such a big mistake, Indian media made fun of the mistake by giving strange arguments that Eleven is considered as a number of power etc. While making fun of Chinese guest’s name Indian govt. forgot that one year ago when Mr Nawaz Sharif reacted over the Manmohan Singh’s blames against Pakistan in UNO and termed him as “angry woman of village who always complains against others”. Over this statement Indian media and politicians severely criticized Pakistani President. 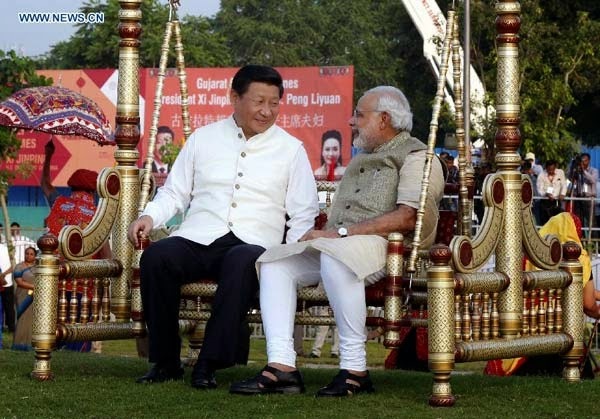 Dual standard or hypocrisy of Hindu India can be realized from this that when Chinese President arrived Vandnagar, Gujarat on the invitation of Narendra Modi, he was made to sit on ground in the name of tradition and culture because Modi had realized that Chinese President is not going to give any big package of investment to India. Perhaps this is why in New Delhi, it was posed as Indian govt. 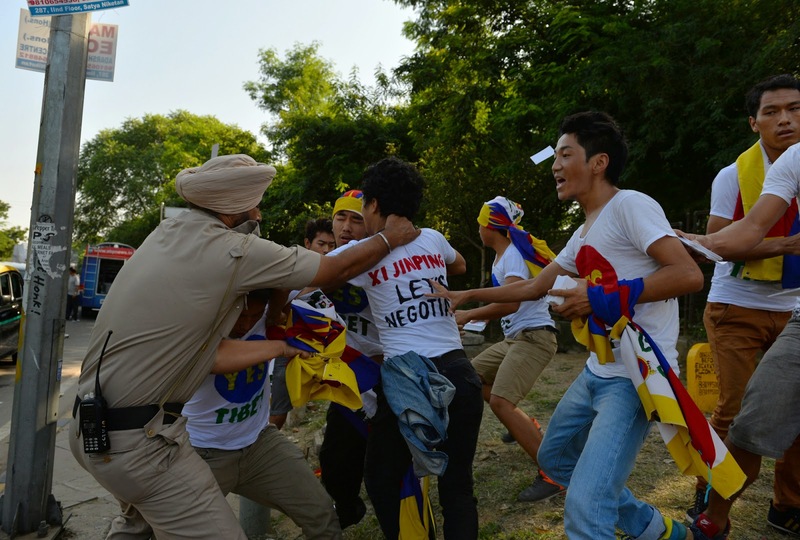 had kept Tibetan and Arunachal Pradesh people away from Chinese guest, Indian Police also arrested 55 Tibetan but in Gujarat Indian Secret Agencies planned protests against Chinese President outside of his residing place by Tibetans.